Experimental robot created by Dr.Light to enable time travel. Can slow down time briefly! His charge attack activates Time Slow. 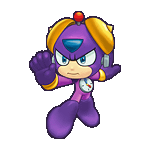 By keeping the attack button pressed Timeman will start charging and once the charge is complete and you let go of the attack button he will activate TS. Keep in mind that since you’re using the attack button Timeman will first fire his weapon, so don’t go destroying valuable blocks now. As one would expect Timeman’s power lies in his Time Slow (TS). By slowing down time he can pass impossible obstacles, such as fast running conveyor belts into the opposite direction with no jumping space. It also slows down enemies, bullets and explosions, which is also demonstrated in challenge mode where you have to run through the exploding bullets in TS. Time Slow does not increase the distance an object can travel, but in combination with TS, the added slowdown might chance the position where the object will land. This can be done with Timeblocks, that are especially affected by TS. For instance, a 4X conveyor belt with 3 space gap will throw the block down the gap, but in TS, it will end on the solid space after te 3 space gap. Timeblocks can only be destroyed by Timeman’s weapon. Their additional feature is that they slow down a lot more then other blocks in TS, allowing you to use them as platforms when they fall. Check out Conveyor Crossing in Timeman’s challenge mode to get a good idea of it. TS however is not without disadvantages, since it slows down objects, jumps can become far harder, if not impossible. For instance jumping over 2 horizontal spikes on a gutslift is easy, but in TS mode you’ll have to wait to the last possible moment to make the jump. Another example is that it is impossible to survive a gap in a gutslift in TS mode, it simply takes to long for the lift to get back up. Timeman’s weapon allows him to fire one clock hand diagonally up and one clock hand diagonally down at the same time. If you want to hit 2 vertical enemies at the same time you need be in their face to hit them. It allows you to hit objects high and low from quite a distance, but you can also use this as a disadvantage, since you only want the upper block to be destroyed for instance. When you activate TS mode, Time Man will say Time Slow and is incapable to move. This small delay can also be a disadvantage as this might just cause you to get hit and die. However if you activate this in the air you will also stay longer in the air, this will allow you to cross bigger gaps and gutslift gaps. Also conveyor belts and water sprouts won’t give you the maximum boost in speed, thus allowing you to make challenges that cannot be passed if you do not use the full speed of said objects. You can also use this to be pushed by items. You can for instance put a 45 degree pendulum and 2 rows of 3 vertical spikes. Then jump up, activate TS and the pendulum will push the air frozen Timeman passed the obstacle. You can also use this with blocks, walking timebombs and water sprouts. You can check out the mentioned example and a lot of other combinations out in Airtime, whose levelID is like all other mentioned level findable on The Master Level List.